Habit: Annual, from taproot. Stem: prostrate, decumbent, or erect; base generally +- brown or +- purple; branches 0 or below middle. Leaf: basal; petiole short or 0. Inflorescence: +- raceme-like; bract 1 per flower, small; pedicel generally thread-like. 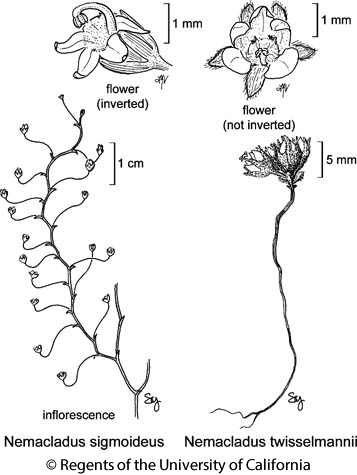 Flower: inverted or not; sepals linear to triangular; corolla +- radial or 2-lipped, lobes 5; filaments free at base, fused into tube around style distally, appendages attached to a stalk or directly on 2 adjacent filaments, each with 2--12 cells, anthers free, all alike; ovary superior to 1/2 inferior, hemispheric to obconic, nectary glands 3, mounded or donut-like, on free part of ovary, stigma 2-lobed, papillate. Fruit: generally > hypanthium, hemispheric to fusiform, top pointed or rounded, chambers 2; open at top generally by 2 valves (or circumscissile). Seed: elliptic to oblong. Species In Genus: 18 species: southwestern United States, northwestern Mexico. Etymology: (Greek: thread-like branch) Note: In descriptions, "filaments" including both free and fused parts thereof. Unabridged Note: Taxonomic changes from TJM (1993) based on ITS, atpB, morphology. Parishella californica nested within Nemacladus, in which it is here treated. Habit: Erect, 4--12 cm, branches from base or 1.5--2 cm above. Stem: spreading, base purple-brown. Leaf: 1.5--10 mm, ovate to elliptic, entire or irregularly dentate, short-hairy, sessile. Inflorescence: axis strongly zigzag; bracts 0.8--1.5 mm, ovate; pedicels 10--18 mm, < 0.1 mm diam, spreading, S-curved, tip erect. Flower: inverted; hypanthium 0.5 mm; sepals +- 1.5 mm, lance-deltate, erect, spreading in fruit; corolla 2-lipped or all lobes held on abaxial side, divided 1/3 to base, white, generally yellow at lobe tips, hairy, tube bell-shaped, 2 adaxial lobes divergent, elliptic, 1--1.5 mm, 3 abaxial spreading, 1.5 mm; filaments +- 1.5 mm, erect, exserted, tip curved, appendages continuous with base of filaments, cells narrow, attenuate, anthers +- 0.3 mm; ovary +- 1/2 inferior. Fruit: +- 2 mm, base oblique, tip acute. Seed: +- 0.5 mm, widely elliptic, with zigzag ridges alternate clearly pitted rows. Ecology: Sandy or gravelly soils, Joshua-tree woodland; Elevation: 50--2300 m. Bioregional Distribution: s SN, Teh, TR, e PR, SNE, DMoj, nw DSon; Distribution Outside California: Nevada, Arizona, Baja California. Flowering Time: Apr--Jun Note: Plant in SNE with corolla to 3 mm. Citation for this treatment: Nancy R. Morin 2012, Nemacladus sigmoideus, in Jepson Flora Project (eds.) Jepson eFlora, http://ucjeps.berkeley.edu/eflora/eflora_display.php?tid=34514, accessed on April 19, 2019.
s SN, Teh, TR, e PR, SNE, DMoj, nw DSon; Markers link to CCH specimen records. Yellow markers indicate records that may provide evidence for eFlora range revision or may have georeferencing or identification issues. Purple markers indicate specimens collected from a garden, greenhouse, or other non-wild location.